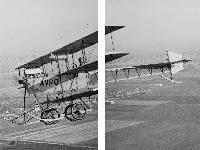 The last of A. V. Roe's primitive triplanes, completed in September 1910, was a single seater structurally similar to its predecessors and powered by a 35 h.p. Green watercooled engine, the radiator for which was mounted in the centre section gap. The shortened bottom wing was retained but the wing chord was somewhat reduced. 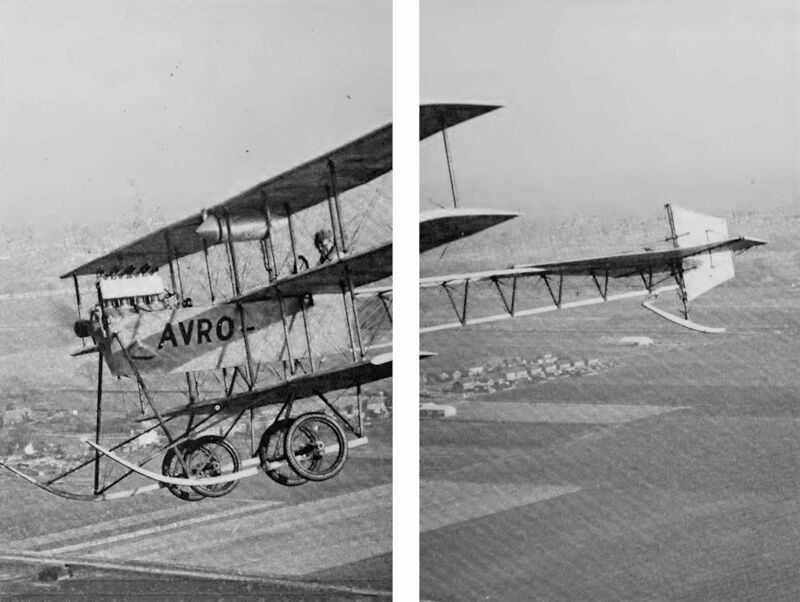 Despite the improved lateral control given by ailerons, the Roe IV Triplane reverted to wing warping, effected by rotating a control wheel mounted on a column which moved fore and aft for diving and climbing. 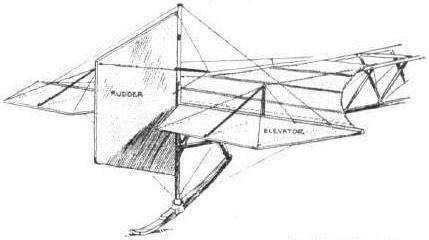 The tailplane was triangular in shape and for the first time of the non-lifting monoplane type equipped with movable elevators. The familiar four wheeled undercarriage of the previous triplanes was also a feature of Roe IV. By the middle of 1910 'A.V.' was fast becoming interested in building a biplane, with the result that only one Roe IV was constructed. It was used almost exclusively for instructional work at the Avro Flying School at Brooklands where pupils found it rather sensitive on the controls and more difficult to master than the earlier machines. Needless to say it was broken many times as on October 10, 1910 when, in the words of an onlooker, "a pupil rose unsteadily and after 225 yards slowly sideslipped into the sewage farm, completely smashing the starboard mainplane." Such incidents were so frequent that they excited little comment and the aircraft structure was so simple that even major damage could often be put right the same day. Several famous pilots were trained on the Roe IV triplane, including Hubert Oxley and C. Howard Pixton, the former starting his training with a flourish by attempting to take off down wind without previous experience and nosing over in the sewage farm on October 17, 1910. Pixton, practising figure eights at 200 ft. on November 8 for his Royal Aero Club certificate, sideslipped Roe IV into the ground, where it caught fire and suffered extensive damage. Nevertheless the machine was out again on November 17, back in the sewage farm by December 4 and carried Pixton successfully through the tests for his aviator's certificate on January 24, 1911. It continued to suffer at the hands of trainees such as F. Conway Jenkins, Gordon Bell, R. C. Kemp and Lt. W. D. Beatty, until the last mentioned slipped in and badly wrecked it on February 14, 1911. This time the damage took a fortnight to repair and the opportunity was taken to insert a four foot extension piece into the fuselage. Pixton made the first test flight in the revised Roe IV on March 1 and managed to coax it up to 750 ft. This performance contrasted sharply with the usual 150 ft. ceiling associated with this machine. A week later on March 8, engine trouble compelled R. C. Kemp to abandon the tests for his certificate and soon afterwards (certainly no later than August 1911) the Roe IV was dismantled and replaced at the Avro School by the Type D biplane of superior performance. Span (upper) 32 ft. 0 in. (bottom) 20 ft. 0 in. Height 9 ft. 0 in. Wing area 294 sq. ft. Weights: Airframe less engine 350 lb. All-up weight 650 lb. This single-seater, developed from the earlier machines, was the last of A.V. Roe's triplanes. It incorporated a single tailplane with elevators but reverted to warping wings with the bottom wing of narrow chord. The single machine built was retained at Brooklands for the Avro Flying School. It was crashed on several occasions, including a crash on 14 February 1911, when the opportunity was taken, during the subsequent repair, to insert an extra 4ft length in the fuselage. The Roe IV first flew in September 1910 and was operated until August 1911. Power: 35hp Green four-cylinder inline water-cooled. The last of the early Avro triplanes appeared also in 1910 and was the No. 4, a single-seater fitted with a 35 h.p. Green engine driving an 8 ft. 6 ins. propeller. It was used for instruction at Brooklands. Wings with an aspect ratio of over nine were provided, and a return was made to warping on the uppermost planes. The wings were fixed and the non-lifting monoplane tail carried a normal pair of hinged elevators. The triangular-section wooden fuselage was retained, the forepart being aluminium-covered. Description: Single-seat tractor triplane. Wooden structure, fabric covered. Manufacturers: A. V. Roe & Co., Brownsfield Mills, Manchester. Power Plant: 35 h.p. Green. Dimensions: Span, 42 ft. Length, 30 ft. Wing area, 294 sq. ft.
FROM THE BRITISH FLYING GROUNDS. BROOKLANDS has again distinguished itself. When Mr. Cody, flying his Cody biplane on Laffan's Plain, recently captured the all-British record for distance and duration - 94 miles in 2 hrs. 24 mins. - the British airmen here determined to go one better. There were several aspirants to the honour, Mr. Sopwith, on the Howard Wright biplane, and Mr. Pixton, on the Avroplane, being warm favourites. The odds, however, were slightly against Mr. Pixton, as the magnetism of the sewage farm had to be discounted. To Mr. Sopwith, the aviator, and to Messrs. Howard Wright, the builders, we have to extend our hearty congratulations on having put up on Saturday last a new all-British distance record of 107 miles, and at the same time established a British duration record of 3 hrs. 12 mins. for any type of machine, British or foreign, flown in this country. Mr. Sopwith has also by the same flight achieved the best performance to date for the British Empire Michelin Cup. The Howard Wright machine on which these records were made is a biplane fitted with a 60-h.p. E.N.V. engine and Spiral tube radiator. It has a Farman type wheel-base, monoplane tail and elevator, with a central rudder above and below the tail plane. Mr. Sopwith first flew a Howard Wright monoplane - this was only some few weeks ago - and we drew attention in a previous issue to the rapid progress he made. He has only had delivery of the biplane a few days, which speaks well for the ease of control of this make of machine. This flight and triple record breaking naturally by comparison overshadows the smaller events of the week, although much good work has been put in by the other tenants. Mr. Graham-Gilmour on Thursday last week piloted the Martin-Handasyde for straight flights at about 20 feet high. Mr. Collier rolled the Otazell, as did Mr. Oxley the Avroplane and Mr. Macfie his biplane. The Bristol-Gnome, piloted by a pupil, made short flights, and Mr. Sopwith was out carrying passengeis. 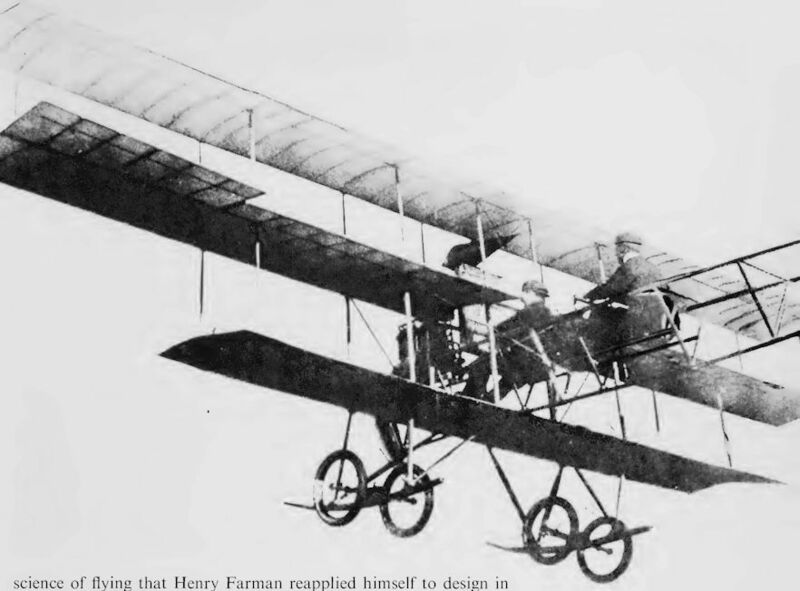 On Friday Mr. Low took up a passenger on the Bristol-Gnome, and Mr. Snowden-Smith made several circuits, at a good height, on M. Blondeau's Farman. Mr. Sopwith, on the Howard-Wright, remained in the air for half an hour, and Mr. Pixton was flying the Avroplane. The Macfie and Otazell were seen rolling. On Saturday all minor essays were eclipsed by Mr. Sopwith's performance, but Mr. Morisson, on his single-seated Gnome-Bleriot, did remarkably well, rising quickly and at an acute angle. The Avro team, Messrs. Pixton, Oxley, Beattie and Jenkins, all did their utmost, and returned the machine home without a scratch. The Bristol-Gnome was also flying. Sunday, mud, rain and wind kept shutters up, and people away. On Monday the Spencer-Stirling biplane, fitted with R.H. engine, made short flights. Mr. Sopwith, on his Howard Wright biplane, and Mr. Low, on the Bristol-Gnome, made several circuits, the latter with passengers, otherwise there was little done. Mr. Oxley was the first out on Tuesday, the 29th ult., followed later by Mr. Pixton on the same machine. The latter was flying off and on for the whole afternoon. He is a very daring and pretty flyer, but the sudden movements he makes must put a severe strain on the bodywork. In particular, one dive and sudden righting appeared to actually bend the body, and it speaks well for the work Mr. Roe has put into his fuselage that nothing serious happened. We do not wish to appear pessimistic, but if Mr. Pixton continues his progress on his present lines we doubt whether he will get through life unmaimed, and the science may lose the fine work which so promising an airman can put in. The outstanding event of the day was Lieut. Snowden Smith's flight to Aldershot and back on the Farman biplane belonging to Mrs. Maurice Hewlett and M. Blondeau. This is referred to on P. 995. Mr. Low contributed his quota by vol plank from about 200 ft., and carrying passengers on the Bristol-Gnome. Mr. Sopwith, resting on his laurels, gave pleasure or otherwise by carrying passengers of both sexes. Mr. Fisher and Mr. Raynham, on "Neale VI," made hops and short straight flights, as did also the Spencer-Stirling biplane. M. Blondeau was passenger carrying, and at one time attained a good altitude. GOING back into the early days before flying was popular and practical encouragement mostly conspicuous by its absence in England, the figure of A. V. Roe stands out in a kind of forlorn loneliness that is peculiarly British. Inspired by the conviction of the great future of flight, energised by the enthusiasm of the true pioneer, but handicapped always by lack of the wherewithal to do the thing properly, Roe struggled laboriously to achieve what, nowadays, is an almost ordinary accomplishment. Even to-dav, however, he is still original in his ideas, and his firm build the only triplane on the world's market. Regarded purely from a commercial standpoint it is possibly a pity that the Avroplane, as Roe called his machine long before it would fly, did not belong to one of the more popular types, for popularity is the greatest of all commercial assets these days, whether as a matter of business or pleasure. On the other hand there is nothing so fickle as this aspect of fortune, and in the present struggle between the inherently fast monoplane and the evolved light biplane racer, it may yet be that the triplane shall come to its own. Fundamentally the problem of flight is to obtain the greatest supporting area for the least weight and the principle of superposed planes, so strongly advocated by such early pioneers as Wenham and Phillips, is by no means necessarily limited to the biplane formation, originated by Chanute, that is so popular to-day. 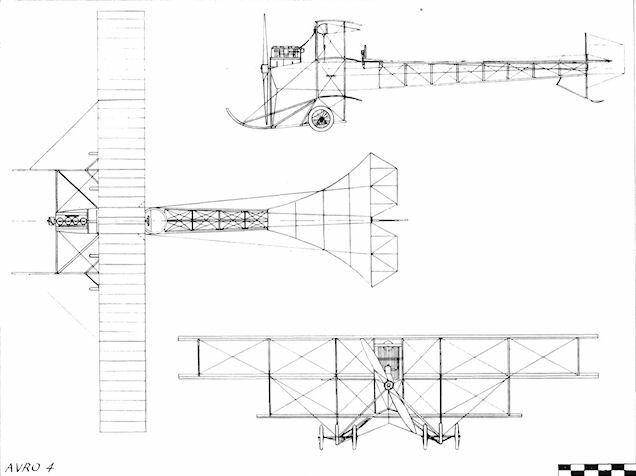 The three-decker built with the monoplane type body is, as may be seen by the accompanying illustrations, by no means an ungainly machine, and it is at least interesting that its outstanding feature, which is the combination of the monoplane body with multiplane wings, has already found its way into general biplane construction, and characterises one or two of the prominent machines at Olympia this year. Not unnaturally the Roe triplane has undergone many modifications in design, but its present form is unquestionably the most shipshape, as it is likewise the best flyer. Originally a machine that was practically a tandem triplane was constructed, but the multiplane tail member gave place to a simple monoplane directive organ that carries none of the essential load. The system of control, too, is now more or less conventional, the tail member carrying a single plane vertical rudder between the two parts of the divided monoplane elevator that form hinged extensions on a rigid triangular tail. The elevator is operated by a to-and-fro motion of the steering column, while the rudder is controlled by a pivoted cross-bar forming a foot-rest. A steering wheel mounted at right angles to the axis of the pivoted column is the means of maintaining lateral balance by warping the wings, but it will be observed that in the latest machine the lowest of the three planes has less span than the others, and it is only the latter that are influenced by the warping movement. The body of the machine is an open triangular section girder made of ash and trussed with wires. It is situated just beneath the level of the middle plane, and its fore part is cased in from the engine to the pilot's seat. The engine itself, as may be observed from the illustrations, is mounted high up in the bows, and the direct driven propeller is some little distance in front of the leading edge of the planes. A simple undercarriage, supported on the Farman principle by four wheels mounted independently in pairs on the two skids, serves to support the entire weight of the front part of the machine, while the tail is kept clear of the ground by a rocking skid anchored to the frame by a piece of elastic. A minor detail of construction indicative of thoughtfulness in design can be seen in the sketch of the mounting of this tail skid, which shows how it has been provided with a special rocker-shaped surface where it takes abutment against the base of the rudder post. Some other interesting constructional details are also illustrated in the sketches, which show the method of fitting the end struts of the main planes loosely into their sockets, and taking the tension by auxiliary tie-wires in order to facilitate the warping of the wings. Another detail illustrated by a sketch is the method of anchoring the diagonal tie-wires to thin steel plates that are clipped against the spars of the body by the principal aluminium brackets. A characteristic feature of the Roe machine, considered as a triplane, is, of course, the relatively high aspect ratio of its planes. Owing to the fact that it has three planes, the same equivalent surface is available from a given span with a considerably reduced chord, and consequently the ratio of span to chord in each plane, which is termed the aspect ratio, has a higher value than is ordinarily to be found in biplane construction. In the machine illustrated a span of 32 ft. is accompanied by a chord of 3 ft. 6 ins., which corresponds to an aspect ratio of over nine. In most biplanes the same factor seldom exceeds six, and in monoplanes it is still less likely to be as high. The advantage of a high aspect ratio is fundamental in character, and has been substantiated in such laboratory experiments as have been conducted. It is concerned with the leakage of air over the extremities, which leakage bears a smaller percentage of the total volume of air dealt with as the aspect ratio increases for a given area of plane. 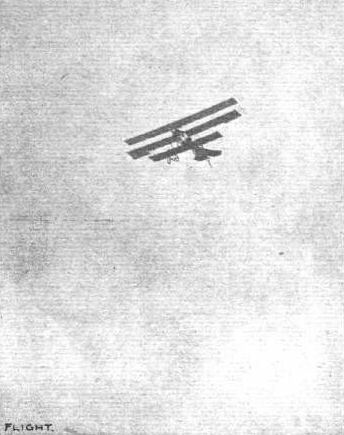 Fundamentally, therefore, the triplane is potentially a more efficient combination than the biplane - provided always that other practical considerations do not interfere with the realisation of this feature - and it is at least to Mr. Roe's credit that he has flown with less power than anyone. In the same year (1910), about a month later, another triplane made its appearance. In this several innovations were to be found, most notable among which was the fitting of a monoplane non-lifting tail instead of the weight-carrying triplane tail with which all previous Avros had been fitted. Another improvement was effected in the arrangements of the controls, which were in this machine made more to conform with standard practice in that the warp and elevator were operated by a hand-wheel mounted on a single central vertical column, a to-and-fro movement of which actuated the elevator, whilst rotation of the hand-wheel operated the warp. A pivoted foot-bar controlled the single rudder working in the opening between the two parts of the divided rear elevator. A Green engine of 35 h.p. was built into the nose of the body, and the radiator mounted between the two inner inter-plane struts above the centre plane. A considerable amount of flying was done on this machine before it was ultimately superseded by the graceful little biplane which even today would compare favourably with modern machines of the same horse-power. Mr. Pixton, on an Avro triplane, making a fine high flight at Brooklands this week. This replica of the cuddly Roe IV was built for the film Those Magnificent Men in Their Flying Machines, and still flies under the aegis of the Shuttleworth Collection at Old Warden, Bedfordshire. The Roe IV triplane at Brooklands. General view of the Roe triplane from behind. Rear view of the Roe triplane. Sketch of the tail on the Roe triplane. 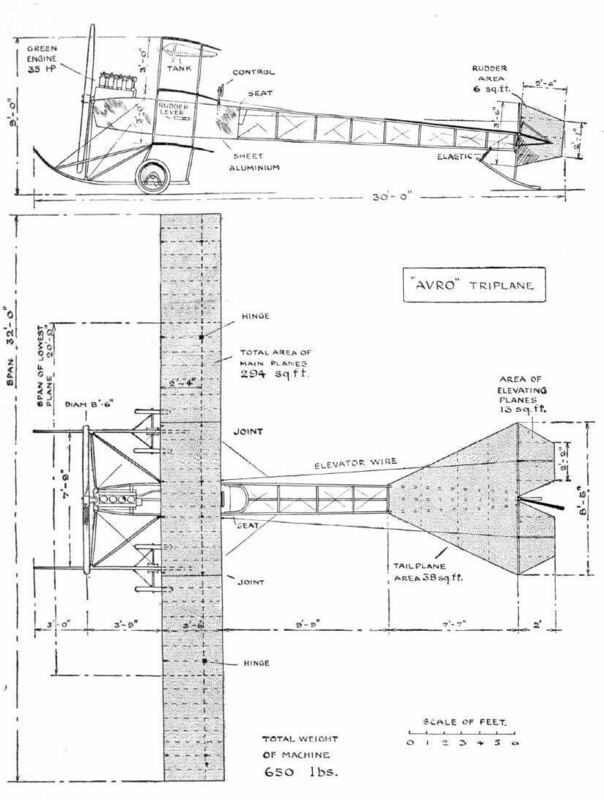 Sketches illustrating some constructional details on the Roe triplane. Roe IV Triplane. The last of AV Roe's triplanes first flew in September 1910. THE ROE TRIPLANE, 1911. - Plan and Elevation.